Employees keep some of the busiest and most successful corporations in the world afloat, and without employees, a company is likely to be unable to execute plans and generate sales. Employees keep the wheels of industry turning and have the ability to send a very small SME to the top – look at Facebook, for example, once a two-man-band headed up by Mark Zuckerberg, it is now a multi billion company that is known for being one of most innovative globally in changing the way that we communicate. In 2017, Facebook was reported to have 25,105 employees across the globe - a figure and that will only increase if their profits maintain their steady progression. With that said, if employees are the backbone of a company,, how much profit do the world’s most successful tech companies make per employee? 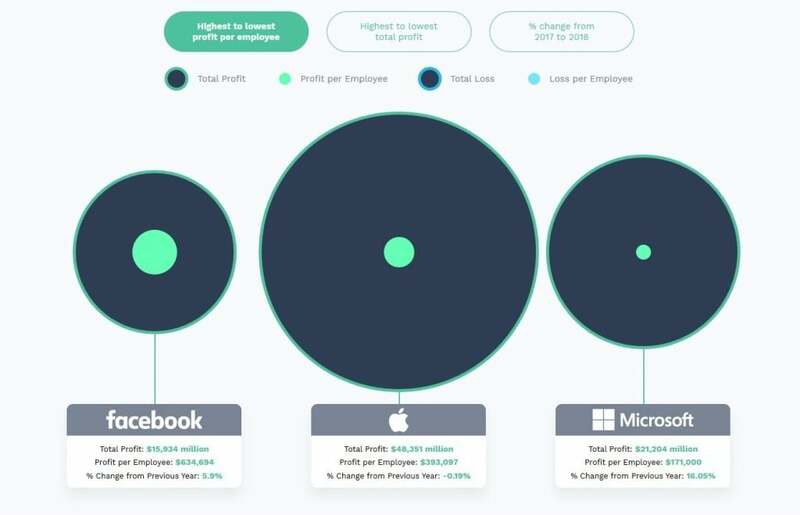 Research by PostBeyond shows how the tech companies listed in the Fortune 500 compare for profit made per employee. Despite Facebook’s big lawsuit this year in regard to user privacy, they still have a total profit margin of $15,934 million - a 5.9% increase from the previous year. Although Apple have a total profit of $48,351 million in 2017, their profit per employee averages out at just $393,097 and is down -0.19% since last year - a figure which is likely to surprise some! Microsoft is one of the longest standing tech companies, and has a total profit of $21,204 million (less than half of Apple’s) and it’s profit per employee stands at $171,000. Despite ranking below Facebook and Apple, it’s percentage change from the previous year is 16.05%. The companies who have had the biggest percentage growth change from their previous year are NetApp (170.81%), Netflix (125.99%) and Amphenol (109.88%) - all of which combined have a total profit per employee of $169,277 million, just under Microsoft’s profit per employee total. Not all companies saw an increase in profit per employee, with some on the list making less per employee; Xerox (-264.42%), eBay (-104.46%) and Motorola Solutions (-89.01%) have been hit the hardest. Data on PostBeyond’s interactive piece here also shows that Dell, eBay and Motorola Solutions are also within the bottom Fortune 500 companies by having the lowest profit: Dell losing $-3,728 million, eBay losing $1,016 million and Motorola Solutions losing $-155 million. What is the worth of each employee in the industry you work in?